The Gay Gamer: I'm guessing you've spent a lot of time playing Tingle's Balloon Trip of Love over the years. What do you like most about it? Joesteve1914: I like the gameplay the most. 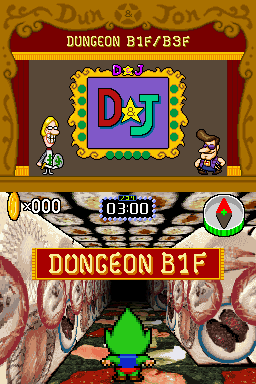 It’s a very strange game, as I’m sure anyone who has heard of it knows, but underneath all the quirky Tingle-ness is a game that pays tribute to--or parodies, depending on how you look at it--several classic game genres. This ranges from point-and-click adventures, to dating sims, to Final Fantasy-style JRPGs, to dungeon-crawlers and much more. The way it merges all of these genres into a Tingle-Wizard of Oz mashup is both amazing and hilarious. The Gay Gamer: On a related note, why should someone want to play a translated version of Tingle's Balloon Trip of Love? Which aspects do you think will appeal most to your average gamer, or what parts of the title will please them the most as they play through it? Joesteve1914: Let me start by saying if you’re one of those people who absolutely hates Tingle, you should give this game a chance. I guarantee you will find yourself smiling, if not laughing out loud, when playing this game. The gameplay is addictive and fun without being overly complex or frustratingly unfair. (Hello, Rosy Rupeeland!) 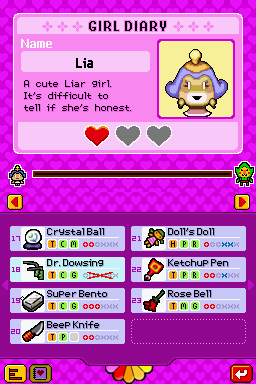 There’s also a lot of references to other Nintendo games, especially The Legend of Zelda series. If you’re a Nintendo or Zelda fan--or both--I can’t recommend this game enough. In terms of the story, I think you’ll be surprised. The game has a heartfelt story and message behind all of its weirdness. The characters are memorable and you’ll definitely find yourself getting attached to them. But don't worry, the game is still a Tingle game, so the humor and the aspect of never taking itself seriously that Rosy Rupeeland had are still here. The visuals are great as well. They’re not the most advanced on the DS, but they have a certain charm and they're very well done. 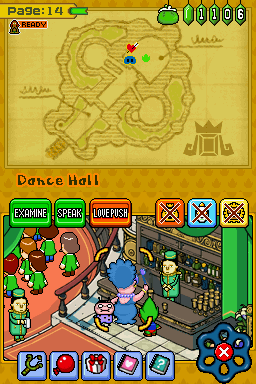 Once again, if you've played Rupeeland, it’s in the same style as that game. Also, unlike its predecessor, this game’s soundtrack is pretty great. Each song is well done and they all fit the game’s atmosphere perfectly. There’s a few Zelda songs in there as well. The Gay Gamer: How far along is the project? Your most recent comment on the subject seems to suggest it's about 80 percent done, but I think you said that last fall. Can you give an update as to where things are now? Joesteve1914: I'd say it's probably somewhere around 85 to 90 percent done. The script is virtually done, with only a few parts left untranslated, and the graphics also are almost done. Then we have the editing of the script to do. After that we just need to do a beta test, and then the first complete patch will be released. The Gay Gamer: Do you have any idea as to when an initial patch will see the light of day? Is such a thing possible by the end of the year, or will folks have to wait until sometime in 2018 or beyond? Joesteve1914: We set a goal of 2017 for the initial release, and that's still the plan. The Gay Gamer: Is there anything else you'd like to pass along about this project that I haven't yet asked about? Joesteve1914: Only that we hope everyone reading this gives our patch a try. It’s been a long time coming, and we’ve poured a lot of blood, sweat and tears into it (not literally, of course). I can assure you the patch will be well worth the wait. 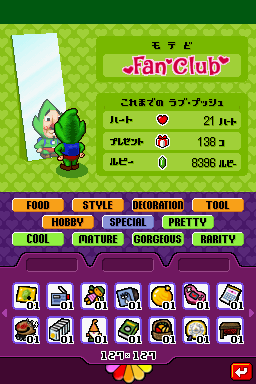 Learn more about the Ripened Tingle's Balloon Trip of Love English fan translation, and stay on top of its progress, at tingletranslation.blogspot.com.